That’s a good laugh line, but the tough thing about it is that it’s also true. This is why the engineering design procedures for all reinforced concrete (pursuant to ACI 318 and 350, which are the key American Concrete Institute standards for concrete structures) allow for cracks to develop. Indeed, some amount of cracking is acceptable in nearly all concrete structures, including slabs on the ground, columns, beams, walls and more. Swimming pools, however, are unique in that the development of even a single significant crack is unacceptable and warrants repair. With inground pools, of course, it’s relatively easy to prevent cracking because the shells are fully supported by the ground, their embedment serving to protect them from external elements. By contrast – and this will be the subject of this series of articles – rooftop pools do not enjoy those protections. This is why, in engineering these structures, the involved professionals must evaluate specific, unique sets of structural issues to prevent cracking and expensive repairs. In most cases, rooftop pools are supported by a concrete slab or vault supported by vertical columns and/or the walls of the structure below. In turn, this slab or the vault’s base structurally spans the distances between its supports, a situation that generates some vertical deflection between those supports. The amount of this vertical deflection – that is, the extent to which a rigid section of concrete flexes under a load – is wholly dependent on the length of the span between supports. These deflections are often slight and invisible to the naked eye, but they are nonetheless sufficient to induce structural cracking in pool shells. 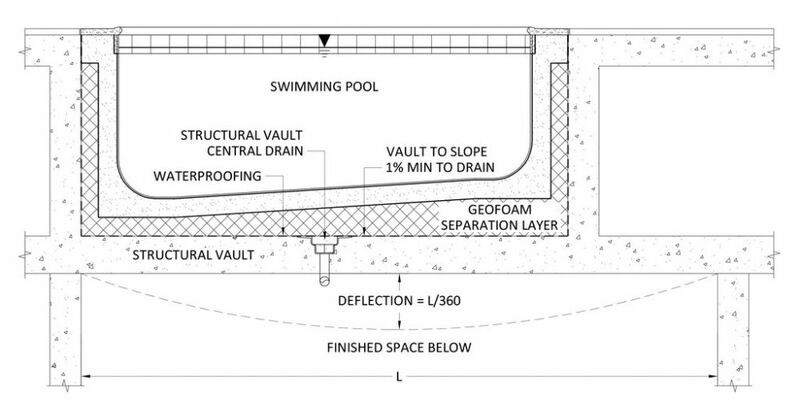 This drawing illustrates the basic profile of a rooftop pool built within a structural vault and set above uniformly spaced structural support. These issues take on additional complexity when the columns supporting the slab or vault are not uniformly spaced beneath the swimming pool. This eccentricity of support creates differential deflection that can cause racking or twisting of the pool structure – a far more consequential structural condition. The type of pool is a factor here as well. With a rim-flow or perimeter-overflow design, for example, the need for creating and maintaining a perfectly level, stable edge can become highly problematic if the supporting slab or vault experiences any sort of deflection. Here we see an illustration of a situation in which the support beneath the pool is not uniformly spaced beneath the pool. This eccentric spacing can result in differential deflection, racking and twisting of the pool’s shell. How much will a slab or vault base deflect? 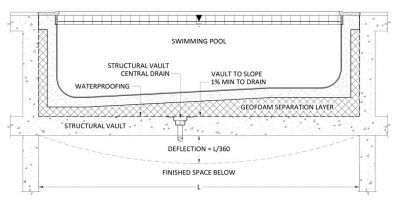 As a general rule of thumb, engineering guidelines say that a slab or vault supporting a rooftop pool can be expected to suffer vertical deflection on the order of L/360, where L is the length of the span between supports. 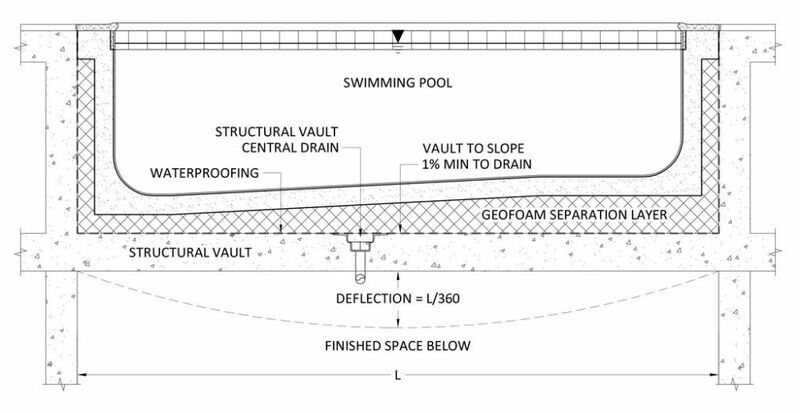 With a 20-foot-wide rooftop swimming pool built with wall supports located directly beneath the swimming pool’s walls, for example, the slab or vault base can be expected to suffer 0.7 of an inch of deflection at its center point. That doesn’t seem like much, but it is actually more than enough to crack a pool. All of this is why, in attempts to work with deflection, swimming pool structures atop slabs or in vaults should always be de-coupled from the support structure. In our consulting work at Terracon (Sacramento, Calif.), for example, we frequently recommend separating the support structure and the pool shell by using a separation barrier consisting of a four-inch layer of geofoam, a structural-grade product that has proved effective in reducing both differential and total deflection of the pool shell. This foam material offers the added benefit of serving as a bond break that prevents any cracks in the underlying support slab or vault from telescoping into the swimming pool. But it is important to note that geofoam reduces but does not eliminate deflection as a factor. While separating the pool shell from the support structure is a good start, it’s not all that needs to be done to protect a shell from deflection. The engineering plan also must include further measures to account for the additional stresses caused by any bending or twisting – a fact that commonly calls for a significant increase in the reinforcement schedule used in forming the shell. It’s important for watershapers to understand how rare it is for a project architect to have the expertise required to understand everything involved in the design, engineering and construction of a rooftop pool – which clearly puts a premium on communication and collaboration. The architect must, for example, be advised on how to design a structural vault that is properly sized to accommodate such elements as geofoam, a drainage composite, the waterproofing material and a topping slab. He or she must also be persuaded to consider the addition of extra structural support (beams, columns or walls) that might reduce span lengths and the resulting vertical deflections. In many cases, however – and especially in high-rise projects – the architect will be powerless to make any building modifications to accommodate the swimming pool. In that case, the project team is left to work within the given project parameters – and sometimes they can get beyond complicated. 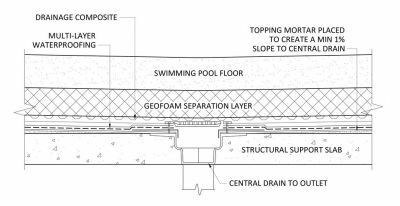 Recently, for example, we reviewed a project where a high rise’s structural engineer predicted the pool could experience up to four inches of differential deflection across the eccentrically supported swimming pool. The architect wanted the pool to have a perimeter-overflow design, but we knew a shotcrete structure couldn’t accommodate that much deflection. After some detailed conversation, the rooftop pool was redesigned as a stainless steel vessel – and we all said goodbye to the overflow system. On its own, this additional steel reinforcement will not eliminate crack development in the pool, but it will reduce the frequency of cracks and, most important, will keep whatever cracks might develop so very thin that they will remain watertight (per ACI 350) and won’t telescope through the plaster finish and reveal themselves on the pool’s surface. A rebar schedule consisting of #5 bars at five inches on center each way is the maximum reinforcement schedule the building code allows in shotcrete/gunite construction without requiring preparation of preconstruction test panels. That’s big steel in most pool-construction contexts, but we specify the use of #5 bars in many of the rooftop pools we design. The key with rebar of this size is the reduction of shadowing behind the steel when the concrete is pneumatically applied. To maintain the utmost structural integrity, we require use of the non-contact lap-splice method to tie all reinforcement. We also require routing of all plumbing pipes either through the geofoam layer or beneath the structural slab: In the context of a rooftop pool, plumbing pipes should never be embedded in the gunite or shotcrete of the swimming pool shell! For all the best practices and most earnest intentions, however, every swimming pool at some time during its service life is going to spring a leak. Seals around light niches and skimmer throats deteriorate, for example, and mechanical equipment will eventually fail and create leaks. 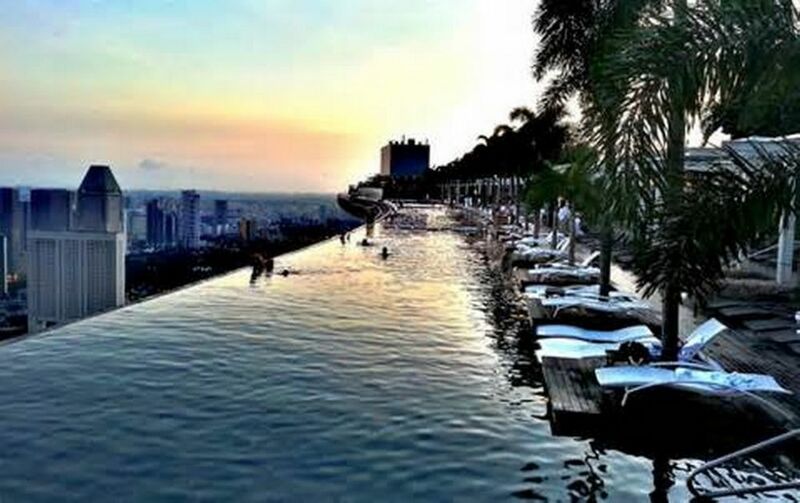 With that in mind, a rooftop pool must be constructed in such a way that any leakage that eventually occurs cannot damage finished spaces below. What that means, of course, is that the concrete slab or vault must be waterproofed and must also include a drainage system capable of collecting any leakage from the swimming pool above and diverting it quickly and safely to a drain inlet. Often, creating this drainage system involves contouring the top of the slab or base of the vault, both of which are commonly constructed as flat surfaces. If that base is indeed flat, a topping slab of grout or slurry must be applied in such a way that it slopes at a grade of at least two percent to a properly flashed drain inlet placed in the deepest point of the slab or vault. 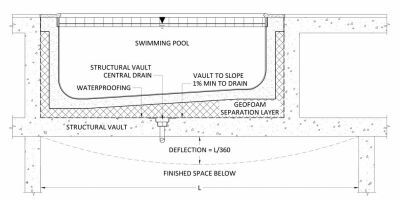 Whether on the bottom of the pool or in the walls, piping runs should be routed through the geoform or directed beneath the slab or vault. As shown in these drawings, there should be no piping runs encased within the concrete shell! The entire surface area of the support structure, floor and walls must be thoroughly waterproofed. We commonly specify a multi-layered waterproofing system consisting of a primer coat, two layers of hot, rubberized asphalt and a protection course. For the most part with hotel, condominium and apartment projects, a waterproofing consultant will be part of the team and will assist in designing this system, including procedures for waterproofing any plumbing penetrations that might be required. 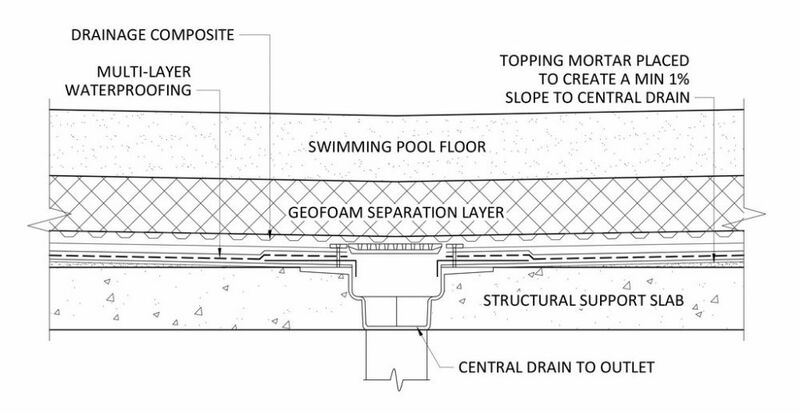 This drawing illustrates the sort of waterproofing systems used in the vaults or on the slabs of rooftop pools. In this case, there’s a topping slab, a primer coat, hot rubberized asphalt and a geotextile composite – all sloping toward a drain inlet. After application of the topping and waterproofing, the entire area inside the vault must be blanketed with a drainage composite fabric such as Miradrain (Carlisle Coatings & Waterproofing, Wylie, Texas). As we’ll see in the second and concluding article in this series, things can still go wrong even if you’ve covered every conceivable base. These issues will compromise system performance, sometimes dramatically. Even so, the task facing everyone involved in the project is to anticipate leak potential and devise ways to render them harmless so a rooftop pool can perform admirably for the long haul. It’s all about covering contingencies – and sometimes having to deal with truly weird issues that can crop up in the course of any big construction project. Next time, we’ll dig into a pair of case studies that explore the design, engineering and construction principles discussed in this introductory article – and look into a few of the odd and often unpleasant surprises that can arise. I heard that a glass swimming pool atop a building broke a while back! It goes without saying that such containers for water need to be more strong and sturdy in order to make sure that they are safe!